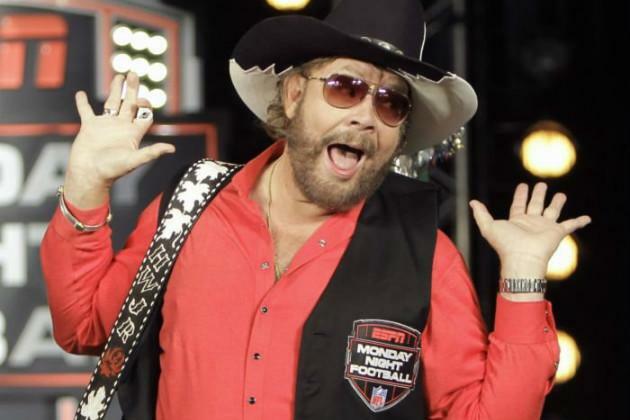 Hank Williams Jr., whose "Monday Night Football" theme song was pulled by ESPN last year after he compared President Barack Obama to Adolf Hitler, lashed out at the president during a Labor Day weekend concert. "We've got a Muslim for a president who hates cowboys, hates cowgirls, hates fishing, hates farming, loves gays, and we hate him!" Williams reportedly told the crowd at the Stockyards Music Festival in Fort Worth, Texas, on Sunday. Williams was the headliner. Concert goers "let out a loud but less-than-unanimous cheer," Thor Christensen wrote in The Dallas Morning News. The 63-year-old singer began his anti-gay commentary a few songs earlier, mocking "queer guitar pickers" in the middle of "All My Rowdy Friends Have Settled Down" before moving on to his next target: Liberal politicians, who he told to "move to Mexico" at the end of "We Don't Apologize For America." Before it was pulled, Williams' song "All My Rowdy Friends" had opened "Monday Night Football" broadcasts for 20 years. While appearing as a guest on "Fox & Friends" to break down the 2012 GOP presidential field last October, Williams—who campaigned for John McCain in 2008—said the president's golf outing with House Speaker John Boehner at the height of the debt deal talks in June "would be like Hitler playing golf with [Israeli Prime Minister Benjamin] Netanyahu." He later called Obama and Vice President Joe Biden "the enemy." Some of us have strong opinions and are often misunderstood. My analogy was extreme—but it was to make a point. I was simply trying to explain how stupid it seemed to me—how ludicrous that pairing was. They're polar opposites and it made no sense. They don't see eye-to-eye and never will. I have always respected the office of the president. So Fox 'n Friends wanna put me down/Ask for my opinion/Twist it all around. Well, two can play that gotcha game you'll see.